When you take the computer version of the GED Mathematical Reasoning test, you have access to an on-screen calculator for all but the first five questions. You may not need it for some questions. In fact, if you can do the math in your head, you can save yourself some precious time. 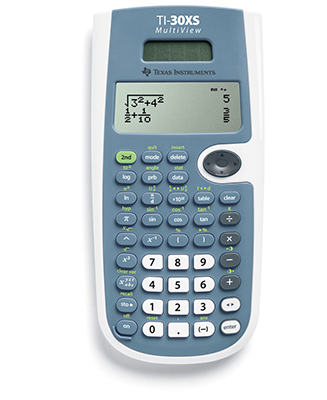 However, when the math is complicated or you want to double-check your computations, you can click the Calculator button in the upper left corner of the screen to access the calculator, which is an on-screen version of the TI-30XS MultiView hand-held calculator shown here. Credit: Images used with permission by Texas Instruments, Inc. Finally, you’d have to add 33 to 9 to get 44. If you’re accustomed to using a typical hand-held calculator, we strongly encourage you to get oriented to the TI-30XS so you don’t have to transition to it on test day. This primer will help. One of the biggest adjustments you need to make when transitioning from a typical calculator to the TI-30XS is that you may need to use the arrows in the upper-right portion of the keypad to move up or down in a fraction or to move outside of certain operators. to clear the display. Otherwise, previous values stored in memory may be added to what you enter, leading to a wrong answer. Remember the order of operations: Parentheses, Exponents, Multiplication, Division, Addition, and Subtraction, or PEMDAS for short. The order in which operations are performed is always important. Perform operations in the wrong order and you may get the wrong answer. to group operations that need to be performed first. Note that many of the keys on the keypad have two functions. The white label on the key itself indicates the key’s primary function. The green label above the key indicates its secondary function. To activate the key’s primary function, simply click the key. only when you’re ready to have the calculator solve the equation you entered. and key in the number. If the square root is part of a longer equation, click the right arrow key to move out from under the radical sign before entering the next operator or value. You may have a need to store a value and recall it later for use in another calculation. Note: Some people prefer to use a real calculator. You may bring this calculator to the test if you prefer. That allows you to practice ahead of time. However, be sure to check with the GED Testing Service to confirm which calculator(s) they currently allow.